There's nothing like renewing your passport and looking at the difference 10 years makes to get you thinking about anti-aging products! I have to tell you that I see aging as a privilege, however I do want to keep my skin looking as good as it can for as long as it can and whilst I do take care of my skin, there are some products that I feel would enhance my routine further in the anti-aging stakes - some are skincare and some are tools, the main one being the 3-in-1 Micro Current Facial Enhancer from Panasonic. A less expensive alternative is the Sarah Chapman Skinesis Facialift. I've watched her video showing how to use this tool and although it looks like it might be a little painful (I have swollen lymph nodes around my jaw and neck), it would save massaging my cleanser in manually. Plus I like that it helps with lymphatic drainage. After reading Anne's (my other skincare guru) recent post about loss of collagen, I realised that I don't have any "collagenous" products in my routine, so when I saw Algenist GENIUS Liquid Collagen in the "new in" section on Sephora, it went straight on to my wishlist. It contains the highest concentration of active collagen - need I say more? Also on my wishlist is Drunk Elephant T.L.C Framboos Glycolic Night Serum. My skin responds well to Glycolic Acid and this serum promises to resurface dull skin, which in turn means a reduction in fine lines and the visibility of pores, improvement in pigmentation and overall luminosity. 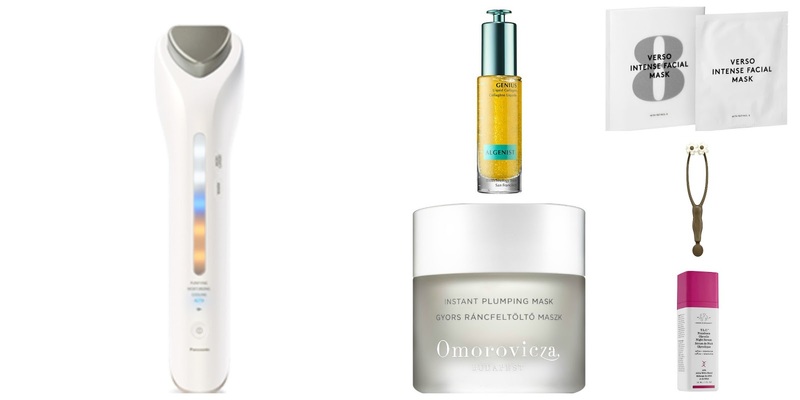 Finally there are two masks I want to try: Omorovicza Instant Plumping Mask and Verso Intense Facial Mask. I'm a huge Omorovicza fan (brand focus here) so this overnight mask, packed with hyaluronic acid to plump the skin sounds right up my street! For a quick fix, the Verso masks sound like they would work a treat - they are rich in Retinol 8, so called because it's 8 times more potent than typical retinol, which is the only proven anti-aging ingredient. All I need now is to win the lotto and make all of these mine! Better go and buy my ticket for tonight's draw! Do you have your old passports? Can you see a difference in your facial contours and skin in general when you look at old photos? I'd love to hear! All products are bought by me, unless otherwise stated. Opinion is always my own. This post was written in collaboration with Panasonic.